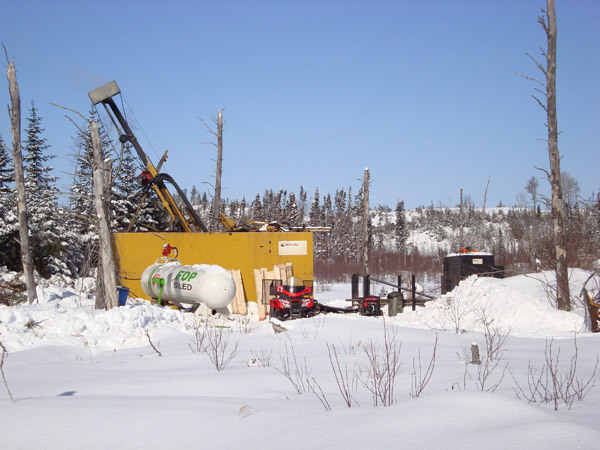 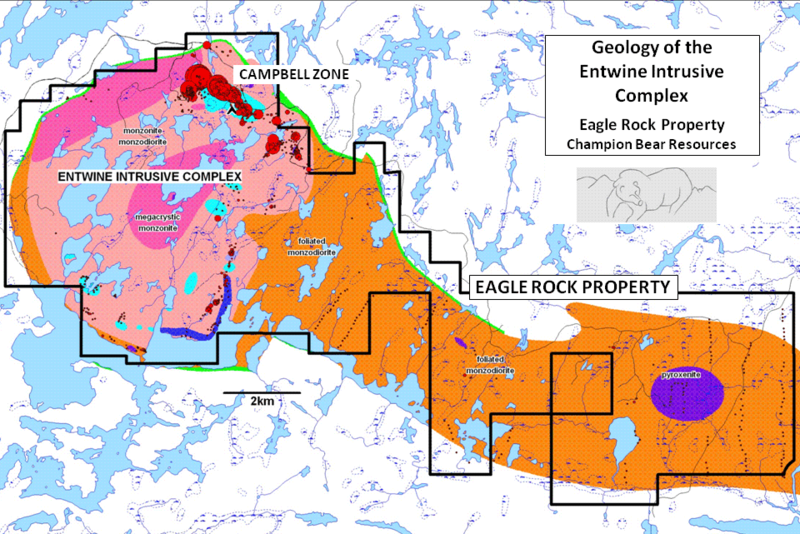 The Eagle Rock Project is located 60km south of Dryden in NW Ontario. 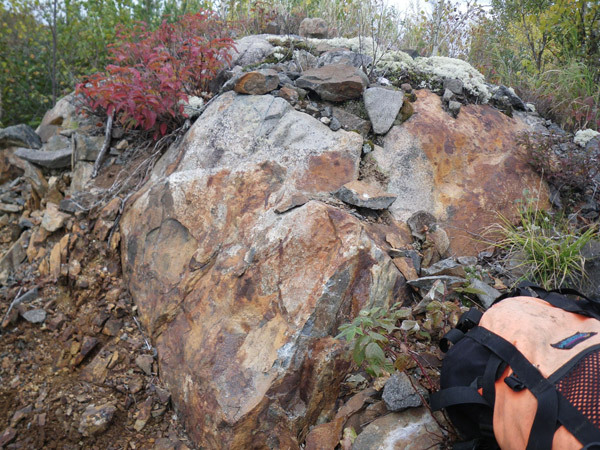 The large property (20 x 6km) overlies the large Entwine Lake Intrusion which hosts several sulphide showings including the Campbell Cu-PGE Zone. 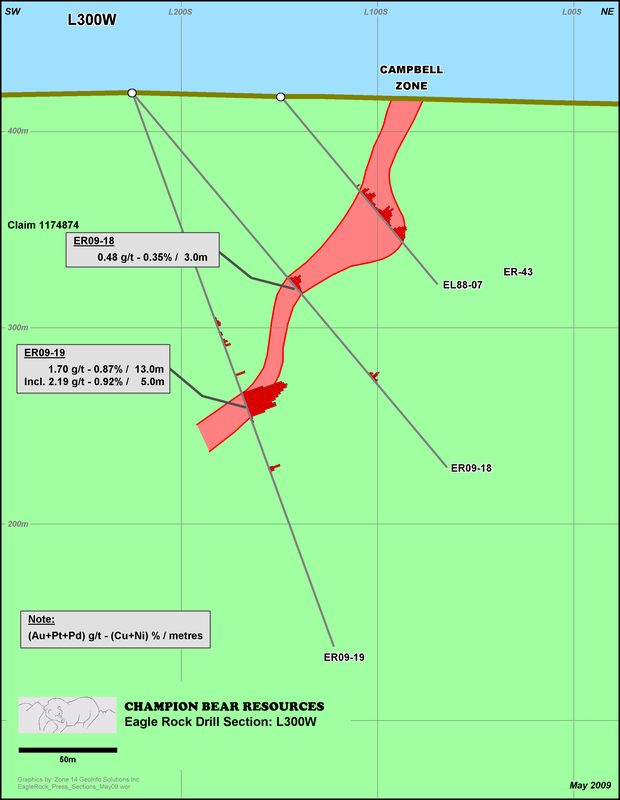 The Campbell Zone is a continuous, predictable PGE reef-type horizon exposed at surface for > 1km, is defined by drilling (75 holes) to a vertical depth of 200m, and has an average width of 8m. 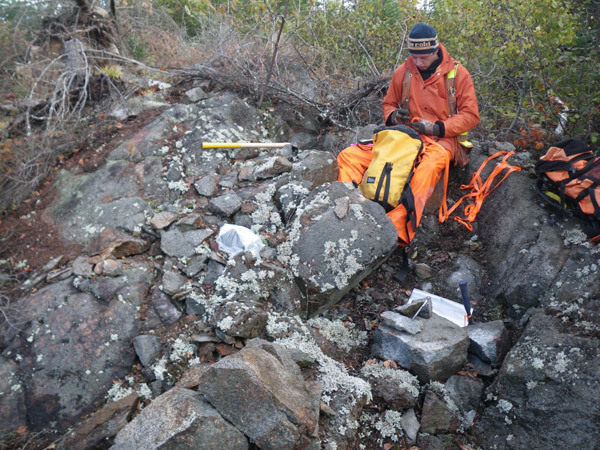 The Zone is characterized as a low-sulphide (typically < 5% chalcopyrite + pyrrhotite), high-metal tenor horizon with typical grades of >1g/t Au+Pt+Pd and 0.5% Cu. 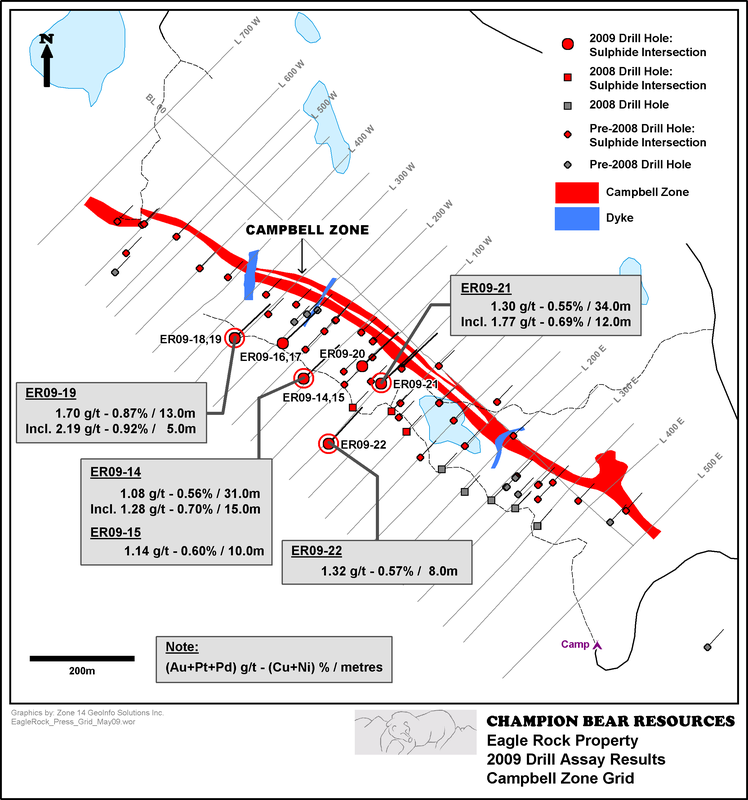 Campbell will be evaluated for its potential as a viable open pit operation. 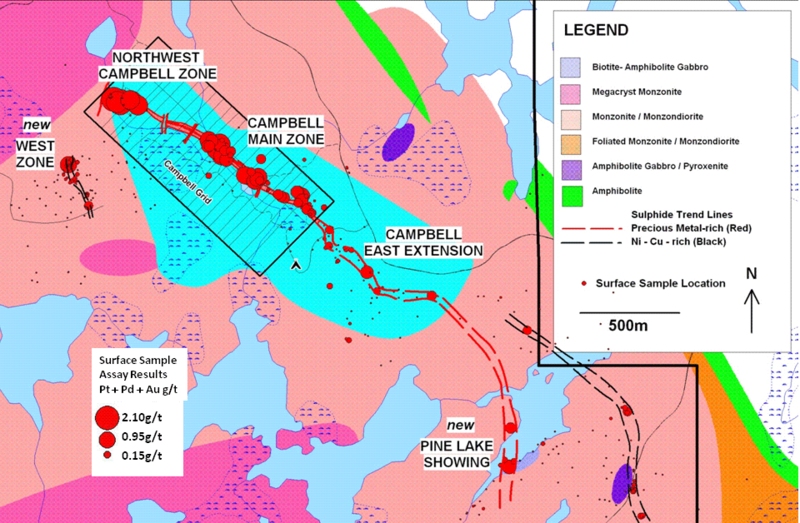 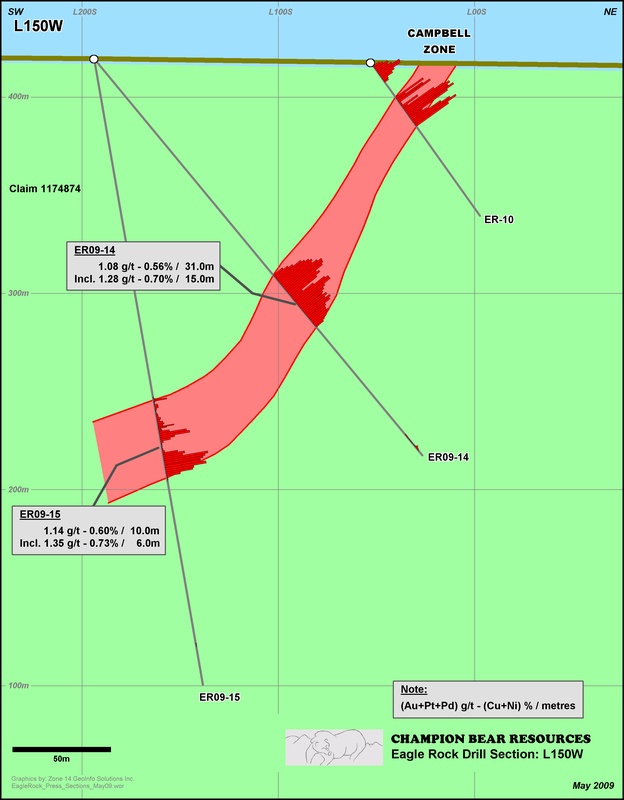 Drilling at the Campbell Zone successfully expanded the sulphide mineralization along strike to the northwest and down-dip, with intersections of, for example, 1.70 g/t Au+Pt+Pd over 13.0 metres (hole ER09-19); in addition, drilling filled critical gaps in the key central area of the Zone with intersections of, for example 1.30g/t Au+Pt+Pd over 34.0m (hole ER09-21). 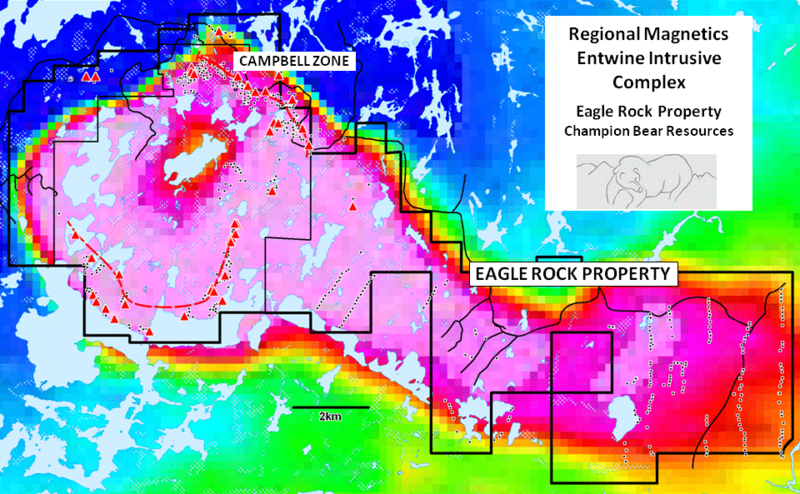 Exploration plans are to continue the drill program to define the nature and extent of the Campbell Zone in anticipation of an evaluation to determine its Open Pit potential. 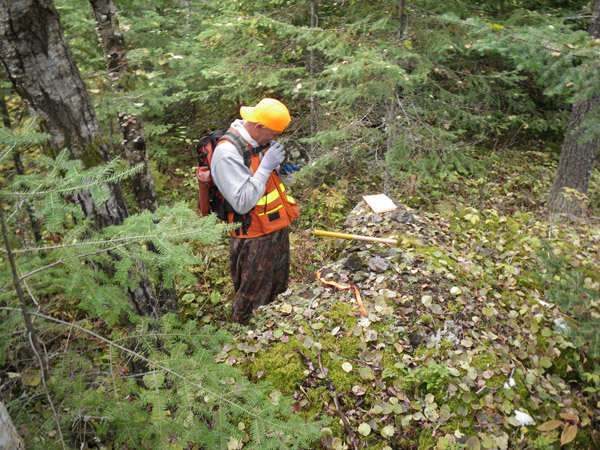 An HRAM Survey (high-resolution airborne magnetic) is planned in conjunction with prospecting and geological surveys are planned. 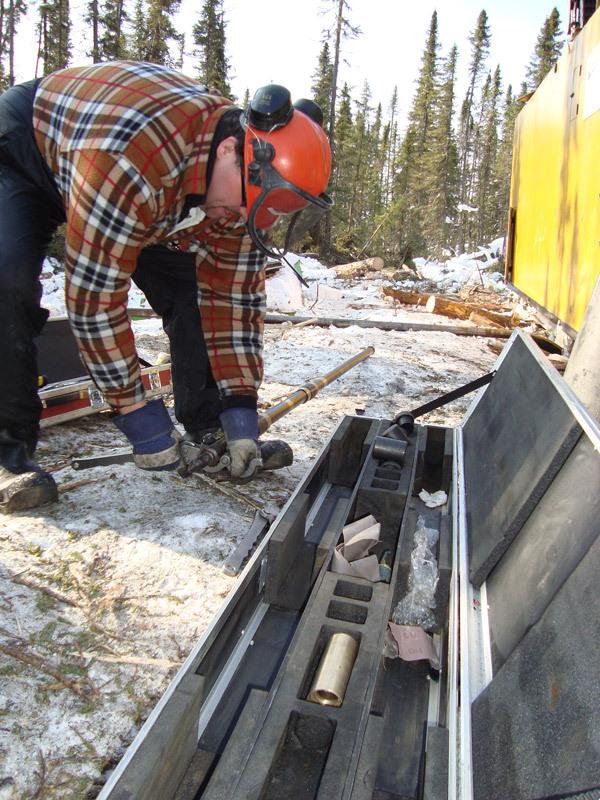 This work will effectively map the extent of the Campbell Zone trend and associated sulphide occurrences as well as identify new stratigraphic horizons and addition mineralized showings. 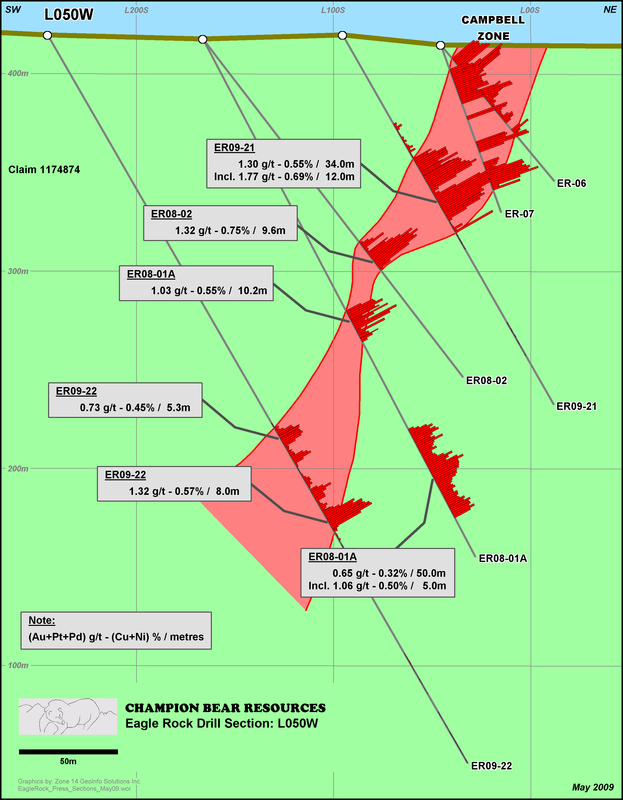 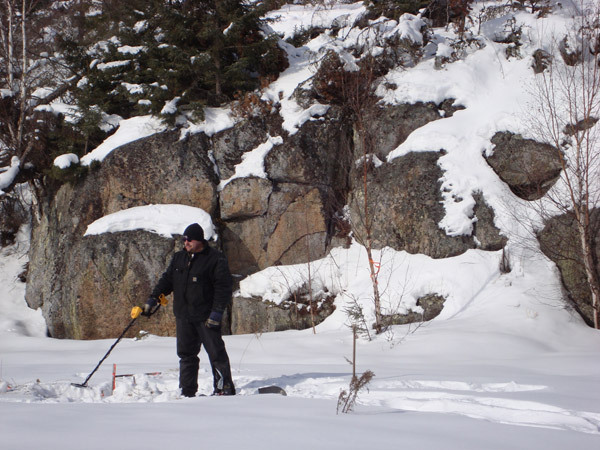 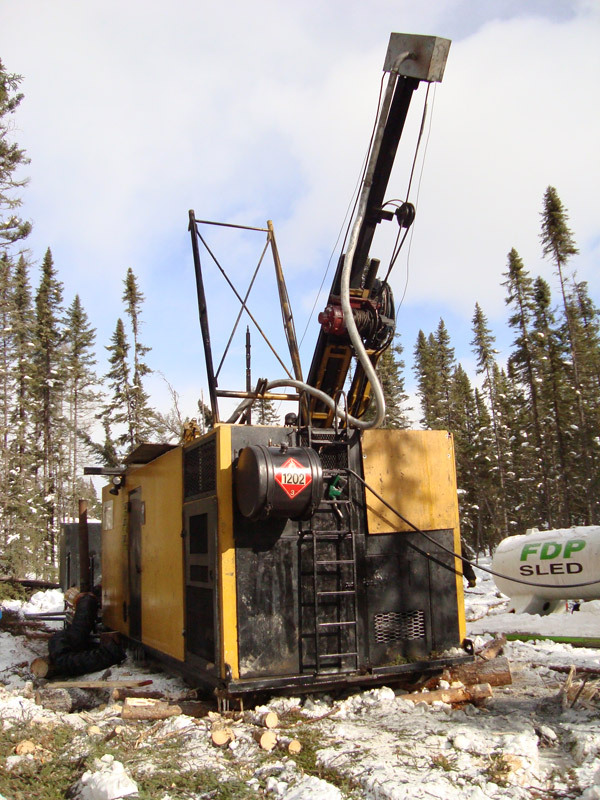 Multi-million dollar surface and drilling program to discover and quantify additional Cu-PGE mineralized zones throughout the Entwine Lake Intrusion. 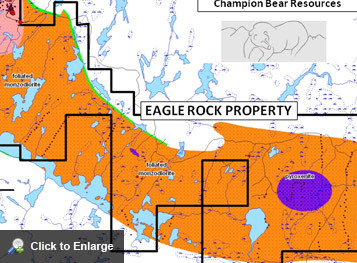 Champion Bear Ltd & Canadian Platinum Corp., Technical Report on the Eagle Rock Project, Northwestern Ontario dated October 7, 2011.